The Hump restaurant is accused of selling whale meat, which is illegal in the United States. Los Angeles, California (CNN) -- A trendy California sushi restaurant says it's closing after being accused of serving illegal whale meat. The company that owns Santa Monica's The Hump restaurant had already apologized for the whale meat accusation earlier in the week. 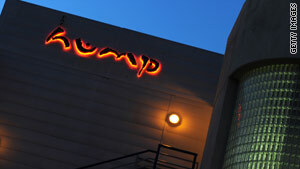 The restaurant's Web site said: "After 12 years doing business in Santa Monica, The Hump will be closing its doors effective March 20, 2010. The Hump hopes that by closing its doors, it will help bring awareness to the detrimental effect that illegal whaling has on the preservation of our ocean ecosystems and species." The investigation into the eatery began in October when two members of the team that made the documentary, "The Cove" visited The Hump, officials said. "The Cove," which exposes the annual killing of dolphins at a Japanese fishing village, won the Academy Award for Best Documentary earlier in March. Armed with a hidden camera, two women from the documentary captured the waitress serving them whale and horse meat and identifying them as such, a federal criminal complaint said. A receipt from the restaurant at the end of the meal identified their selection as "whale" and "horse" with a cost of $85 written next to them. The women snuck pieces of the meat into a napkin and later sent them for examination to a researcher at Oregon State University. He identified the whale sample to be that of sei whale, prosecutors said. The meat from whales, considered an endangered species, cannot be sold legally in the United States. The restaurant, located at the Santa Monica Airport, is known for its exotic fare. Its Web site asks diners to surrender themselves to its chefs for "a culinary adventure ... unlike any that you have previously experienced." Prosecutors have also charged Typhoon Restaurant Inc., the parent company of the restaurant, and one of its chefs -- Kiyoshiro Yamamoto, 45 -- with the illegal sale of a marine mammal product for an unauthorized purpose. The misdemeanor charge carries a federal prison sentence of up to a year and a fine of up to $200,000 for the company, federal authorities said. The Endangered Species Act and the Marine Mammal Protection Act make it illegal, except under very limited circumstances, to hunt, kill or capture whales and also prohibit trade in the animals or any part of them. CNN's Sonya Hamaski contributed to this report.